If you're feeling tired and worn out, rest assured that you have plenty of company. Fatigue ranks among America's most common health complaints. Life today moves at a faster pace than ever before in history, and many of us feel compelled to keep up. On good days we may manage to accomplish everything on the to-do list. But the cost is steep: When we continuously tap the energy well, it inevitably runs dry. In truth, many of us pay more attention to our bank statements than our energy reserves. For optimal vitality, however, we need to consistently replenish the energy supply in the same way we make regular deposits into a checking account. Many of us already know the formula: Eat a healthful diet, avoid stimulants such as caffeine and nicotine, get plenty of rest and relaxation, and engage in moderate exercise. Unfortunately, as our responsibilities mount, our adherence to these guidelines can falter. But whether or not we live by exemplary habits, there's another element to the energy equation that will quickly build vitality: the herbal energy tonic. Chinese and Ayurvedic medicine have employed tonic herbs for centuries to fortify health and vitality and promote longevity. Now more than ever, these herbs play a significant role in helping us adapt to life's daily stress. Historically, herbal tonics for enhancing energy and vitality had a special place in the repertoire of the world's healers as a vehicle for well-being. By improving the body's functioning at a cellular level, tonic herbs strengthen resistance to both external invaders and internal breakdowns. An herb must meet certain criteria teria to qualify as a tonic. First, it must restore balance and strengthen the functioning of an organ or system without throwing another organ or bodily system out of balance. Tonic herbs accomplish this by exerting a wide range of actions, rather than one specific function. Second, the herb must be safe, nontoxic, and non-habit-forming, even when taken over a long period of time – even indefinitely. According to traditional Chinese and Ayurvedic medicine, the improvement in energy that comes from the regular use of herbal tonics results from a deeper internal shift toward health. Herbal tonics provide a safe way for us to restore balance, rebuild health and vitality, and promote longevity, even in the face of the ever-changing and often trying conditions of modern life. 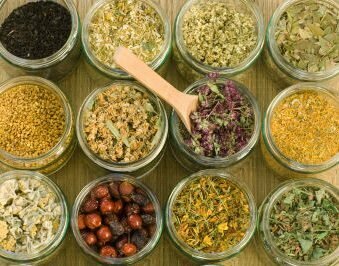 Those looking to build energy and vitality will do well to choose one or more of the following tonic herbs. For optimal benefit, take them for a minimum of three months, under the guidance of a health care practitioner. In time, these plant companions will help restore the energy that the body and mind expend each day, leaving reserves well-stocked to meet evernew challenges. Benefits: Ashwagandha is believed to imbue those who take it with the vitality of a horse. Consequently, men often use it to increase sexual vitality and energy. But ashwagandha is just as appropriate for women. As the most frequently prescribed tonic herb in Ayurvedic medicine, ashwagandha helps anyone suffering from weakness or debility, including the fatigue caused by nervous tension and overwork. In Ayurvedic medicine, ashwagandha has quite a reputation. The herb increases energy and endurance, promotes longevity, supports sexual vitality, calms the mind, enhances mental functioning, rejuvenates the tissues, strengthens immune function, encourages restful sleep, and helps the body overcome imbalances caused by mental or physical stress, poor diet, lack of sleep, or environmental toxins. Ashwagandha also helps as an anti-inflammatory to relieve arthritis and joint pain. Research: Scientists believe that compounds in ashwagandha called ‘withanolides' are responsible for the herb's healing properties. These compoundshave undergone extensive investigation, and although most of the experiments involved test tube or animal studies, the results indicate that the herb clearly has anti-inflammatory, immune stimulating, and adaptogenic benefits. In studies, ashwagandha has stimulated immune cell activity and inhibited inflammation, as well as exerted mild sedative and muscle- relaxing properties. These findings support the herb's traditional use as a tonic to bolster stress resistance and enhance general health and well being. In a study reported in Phytotherapy Research, 232 subjects suffering from long-term fatigue participated in a double blind, 42-day clinical trial. All participants took a multivitamin/ multi-mineral supplement; half also had 40 mg of a standardized extract of ginseng daily (the rest had a placebo). The participants evaluated their symptoms on the first, twenty- first, and forty-second days of the study. At the end of the trial, only 5.7 percent of those taking ginseng reported fatigue symptoms, compared to 15.2 percent of those taking the placebo. Many animal and human trials demonstrate equally significant benefits of ginseng. In another double-blind study reported in Current Therapeutic Research, researchers found that 205 people given a standardized ginseng extract (combined with vitamins and minerals) experienced significant improvement in various measures of quality of life, compared to 185 people given a placebo. The researchers found the greatest benefits occurred in improvement in mood, vitality, and alertness. The patients with the lowest initial quality of life scores experienced the greatest improvement. Dosage: Ginseng comes in a variety of forms: liquid extract, powder, capsule, and tablets. Standardized extracts provide a guaranteed amount of ginsenosides, or the active ingredients. Most clinical studies have used ginseng extracts standardized to 4 percent ginsenosides, at a dosage of 200'500 mg daily. If you're taking a non-standardized preparation, it's best to follow the manufacturer's recommended dosages, because potencies vary greatly. A general dosage for non-standardized preparations is 1'4 grams of powdered root daily or 1/4 to 1/2 teaspoons daily of liquid extract. Traditionally, ginseng is used cyclically, with breaks in between (two weeks-on, two weeksoff, for instance). Precautions: When used as directed at recommended dosages, ginseng rarely causes side effects. However, Chinese ginseng has been known to cause irritability or hypertension in some people. If this occurs, lower the dosage or switch to American ginseng, which is less likely to cause over-stimulation. Don't take larger than recommended doses of ginseng, and do not use ginseng in combination with other stimulants such as caffeine. Siberian ginseng (also known as eleuthero) is not actually a true ginseng, though it's in the same botanical family as Panax ginseng. Benefits: Indigenous to Siberia and northeastern China, eleuthero has been used for at least 2,000 years to improve general health, increase energy, and as a longevity tonic. The herb is an invaluable aid for enhancing resistance to stress, and people who regularly take Siberian ginseng report an increased sense of psychological as well as physical well being. Research: Russian scientists have extensively examined and documented the health-promoting benefits of Siberian ginseng, in the hopes that the root of the spiny shrub could stand in for the more costly Panax ginseng. In more than 1,000 studies, Siberian ginseng significantly increased energy and endurance for both physical and mental tasks, enhanced immune function, and protected against environmental stressors and toxins. The herb also normalizes blood pressure, lowers cholesterol, regulates blood sugar, and strengthens the adrenal glands, which play an important role in the stress response. Scientists have identified compounds in Siberian ginseng called eleutherosides, which have similar effects to the ginsenosides found in Panax ginseng. Many herbalists regard Siberian ginseng as more appropriate for a wider range of people than the more stimulating Panax ginseng. Dosage: To be certain of obtaining high-quality Siberian ginseng, look for products standardized for eleutherosides, the active ingredient, typically to at least 0.8 percent. Follow the manufacturer's recommendations, or take approximately 200'400 mg daily. For best results, take Siberian ginseng for at least three months, with a one-week break before resuming the dosage. Precautions: Considered safe and nontoxic, Siberian ginseng generally has no negative side effects even when taken longterm. While Siberian ginseng can help regulate blood pressure, if you have high blood pressure, consult your doctor before taking the herb. To avoid possible restlessness, don't take Siberian ginseng in the evening.